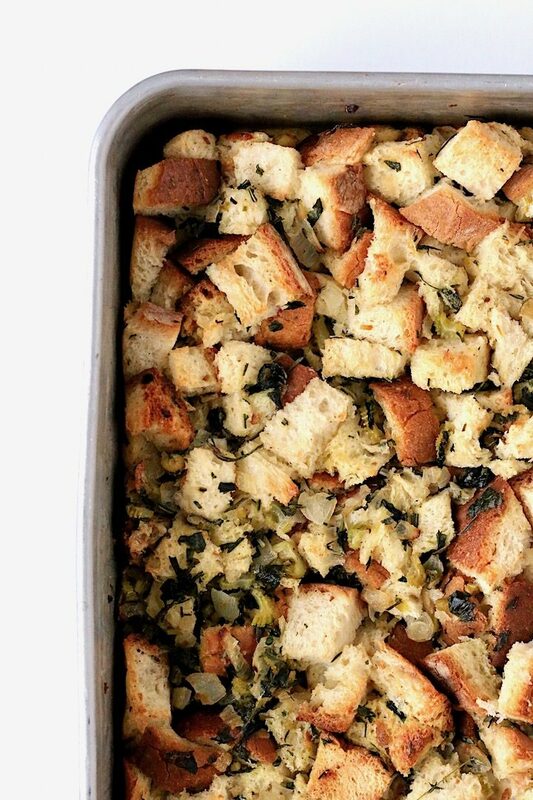 Thanksgiving stuffing (or dressing, if you will) is a classic side dish and when it comes to the classics sometimes simple is best. Classic flavor is exactly what you will find here. I used great flavoring agents like onion and celery and all the favorite herbs: parsley, sage, rosemary, and thyme. Without fail, I will have Scarborough Fair in my head for at least three days after making this. Technically this should be called dressing since I don’t actually stuff it into the turkey but for some reason, I just can’t bring myself to call it that. Unstuffed stuffing is what this dish is. 🙂 The recipe is as basic as you can get. I think that is why I love it so much. Don’t get me wrong I love trying new things and experimenting in the kitchen. But, when it comes to holidays I like to see the traditional mixed with the new. So go ahead and make that fancy new recipe filled with apples, sausage, walnuts, cranberries, and whatever is the new trending stuffing ingredient this year. I am not stopping you. In fact, I am encouraging you to try something new. However, please make this traditional stuffing too there is room on the table for both. And don’t forget to save me a corner piece! 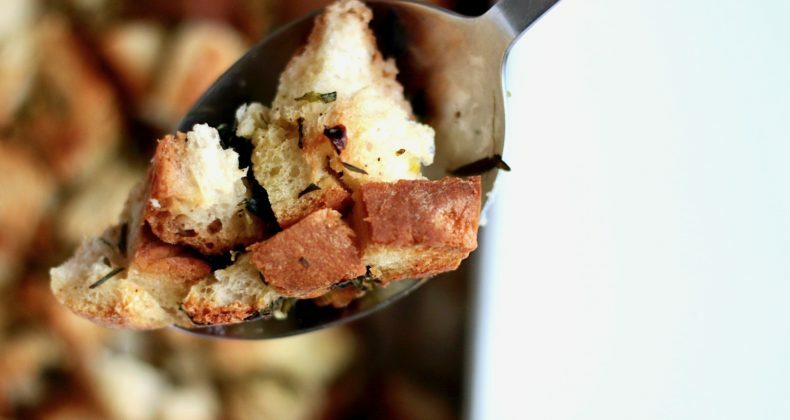 Are you team dressing or team stuffing? Thank you Helene! Stuffing is good at any time 🙂 Perfect for Sunday dinner with roasted chicken. Stuffing is my favourite part of the dinner and this sounds amazing. Loving all the herbs in it. It is probably my favorite too, Dannii. Cover it in gravy and I am happy! I agree Lisa, better and honestly not much more work. Leeks would be perfect! I am going to have to remember that for the next it I make it.